Trent Dillon won the 2016 Callahan award as the best player in the men’s college division. If you follow ultimate frisbee, you know this is the sport’s equivalent of the Heisman Trophy. I ran his campaign, editing his highlight reels and building publicity, and in the following post, will attempt to share what I learned in the process. My hope is that these lessons can contribute to the sport’s further evolution in delivering enjoyable media to international audiences within, and outside of, the sport’s core community. All of the credit for winning the Callahan goes to Trent — he is an outstanding player and an even better person. My job was simply to weave his highlights together to tell a story. Trent being so talented made my job simple and every marketer will tell you the easiest thing to market is a great product. The best college ultimate program of the 2010s. I approached Trent at the end of 2015 and told him that I wanted to run his Callahan campaign. I, like many of my fellow alumni, were frustrated that a Pitt player had never won the title. For some reason, Callahan voters had not valued Alex’s sublime throws, Tyler’s devastating athleticism, Marcus’s do-it-all skill set, nor Max’s reliable, to the point of boredom, consistency the past four years. I wanted to change that and revolutionize the way Callahan highlight are shared with fans and potential voters. We would do this by being the best storytellers of any team in the country. Most Callahan nominees release one video per year. It’s usually a collection of highlights from their entire college career, and often includes plays made in other divisions (club, Team USA, etc.). This raises some issues that we will address below. Our first video would be released before Pitt’s first major tournament, the Florida Warm-Up. The video would show all of Trent’s old highlights on Pitt, club teams, and Team USA. The inclusion of non-college plays has been a consistent criticism of past Callahan videos and this nipped the issue in the bud. It also solved the multiple-star problem. Every year, there are a number of great players on Pitt and they all carry the load from game to game. Without a signature star, around whom the entire offense revolves, it was hard for a casual observer to know where to focus. We changed that with the early Callahan video for Trent. From the first game of Warm-Up, everyone’s eyes were on TD16. Trent dominated the 2016 college season. It also abided by the first immutable law of marketing, “Be First”. From late January, when the video dropped, through late April, the only player who had Callahan associated with his name was Trent Dillon. Small acknowledgements of Trent as “Callahan nominee” by Ultiworld writers or reddit commentators build up over time. As books like Thinking Fast & Slow by Daniel Kahneman illustrate, this has a massive effect on our collective brains. Trent’s campaign literally had a three month head start in burying his narrative into the community’s collective consciousness. 2016 Callahan from the University of Pittsburgh, Trent Dillon. The second video was released with the regular crop of videos in late April and early May. By then, his candidacy and dominance were firmly entrenched in people’s minds. We just had to drive the nail home. By putting up a video that was comprised exclusively of plays from the 2016 season, we separated Trent’s game from the pack appear even more stark. His second highlight reel was as good as anyone else’s, but his was the only one that promised plays exclusively from a single season. The beauty of our strategy was that we allowed the audience to opt in to watching 10 minutes of Trent’s highlights, instead of forcing them to watch an 8 minute video all at once. That was the biggest criticism of Tyler’s video and we learned a lesson there. Our largest risk in this entire strategy was Trent’s health. He delivered with the healthiest season of his college career. Isaac Saul, a Pitt alum and editor at A Plus, helped us drive the nail home with a profile in Skyd Magazine. 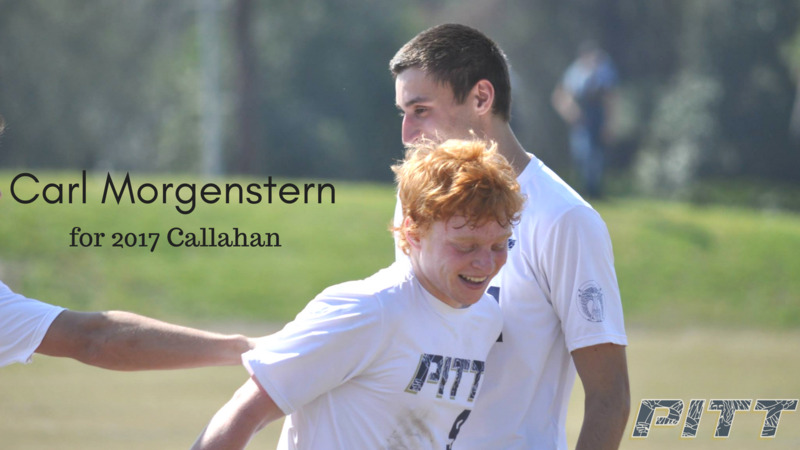 The University of Pittsburgh’s 2017 Callahan nominee for the men’s division is Carl Morgenstern. I’ve watched Carl play for over five years and I am constantly impressed by his work ethic and attention to detail. He is highly qualified to carry on the legacy of great players to represent the University of Pittsburgh in this arena. After Trent won, I predicted that this strategy would be adopted and employed by other college programs that noticed what we’d done. I was proven right when Washington’s Khalif El-Salaam released a “Prelude” video on February 6th, beating our release by three days. I expect this trend will continue as the quantity of college games that are filmed continues to rise. Teams that partner with small video production outfits like Rajan Studios and Seven on the Line Productions will benefit greatly. Tangentially, I expect a market for these types of video producers to explode as the AUDL continues to grow its social media channels through highlights and player profiles. I’m invested in the sport of ultimate’s continued rise in popularity. If you want to discuss anything in this post further, please reach out to me. If you are interested in consulting related to your school’s Callahan campaign, I’m happy to talk. If you need a website for your ultimate tournament, organization, or league, fill out the contact form at the bottom of this page and ask for Aaron. I host a podcast where I interview writers, entrepreneurs and other interesting people. I also send out a newsletter with cool links, books, and other stuff. You should check that out, too.